The weather was lovely yesterday so here is my summery NOTD. It took me forever but I finally managed to do Konad French Tips :) They aren't perfect but it's difficult to get them straight and after hours of re-doing them I was finally happy with these. I used Barry M's Flamingo Pink and plate M57 with Rimmel White for the pattern. I can barely paint my nails one colour without getting really frustrated, so I'd be hopeless. 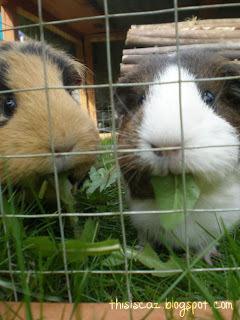 Aw they look so cute munching on their leaves :) love the nails too, Konad is so fidley! That's a pretty konadicure :) I love the nail polish - I'll add it to my shopping list! 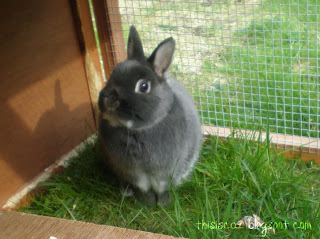 BUN BUN AND GUINEASSS! OMG. I use to have a Guinea Pig it made the craziest noises while I slept... I miss him. Your nails look gorgeous btw! Your nails look great! I need to crack all my konad things out again! Love the mails. What is the process for doing the patterns? Do you need a machine or expensive kit. I'd love to see a step by step post with details. I love your blog and read it all the time even if I don't comment. Keep up the great work. AKA Slummy Mummy to Yummy Mummy! I've tried to do konad so many times and just cant get it to work! !